This ready assembled LED rope lighting kit is ideal for fixed use or mobile DJ's, no complicated assembly required, just unroll it and plug it in for instant party lighting. With 8 pre-programmed sequences that allow you to adjust the pattern from the in line controller included, it's great for discos or even safety lighting, ropelights will help mark out dancefloors or aisles and stairways. Suitable for use indoors or outside, this ropelight kit is highly versatile. 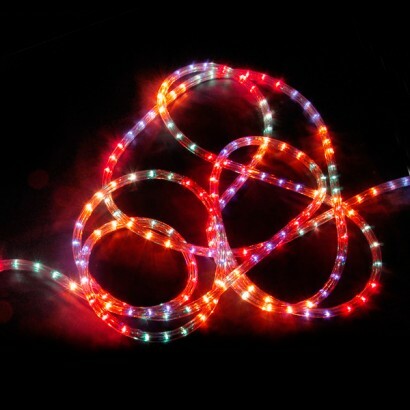 Using LED bulbs instead of traditional bulbs, this rope light kit is energy efficient, bright and very colourful. Ready to use - just plug-in and go! 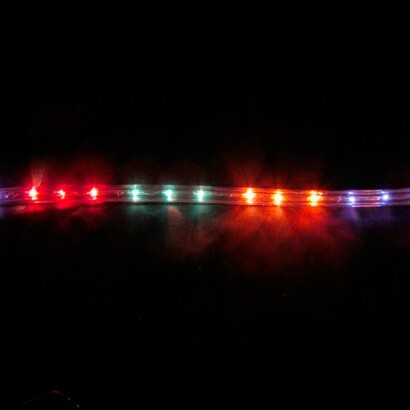 I have been looking for a replacement 20m rope light on my terrace for the past year, had to return a number of rope lights from to other suppliers which didn't do what they said they did on the website or box (effect functions). However these were brilliant, look great and were delivered the very next day! Just what I wanted ---very cheery bright and happy lights. They look terrific coiled among my blue & white jugs. I have been looking for a competitive supplier of rope lighting as an alternative to halogen lights for an event marquee. The reason being to reduce the need to install adequate power supply for 5kW of lighting. The Glow Company combined a good price for 20m ropes with excellent speedy delivery service. At 44W a rope my ten will use less than a tenth of the power required and I believe will be close to the overall light level of the previous system. All round a great deal - especially when running costs are taken into consideration. The icing on the cake is that the tent will look prettier too! Bought the 10m blue one recently for Halloween party. Beautiful colour and different settings for quiet glow or dramatic effects. Ours is wound round the staircase railings and will be staying there through Christmas.